Born: Pau, Pyrenées Atlantiques, 9 March 1923. Education: Studied engineering at École des Pont et Chaussées; studied fashion in Pau and Paris. Family: Married Jacqueline (Coqueline) Barriére, 1967; children: Marie. Career: Cutter, Cristobal Balenciaga, Paris, 1945-61; independent fashion designer, Paris, 1960-61; founded Courréges fashion house, boulevard Kléber, Paris, 1961-65; first haute couture collection, 1965; business sold to l'Oréal, 1965; resumed designing, 1967, with Prototype custom line, Couture Future high priced ready-to-wear line introduced 1969; designed own boutiques, from 1970; first fragrance line Empreinte introduced, 1971; men's ready-to-wear line and men's fragrance introduced, 1973; introduced accessories, leather goods, watches, belts, furniture, luggage, windsurfing equipment and more, from 1979; Hyperbole lower priced ready-to-wear line, 1980; company purchased by Itokin, 1983; fragrances bought by Swiss Burrus Group, 1992; produced collection with Jean-Charles de Castelbajac, 1994-95; bought back perfume business, 1997. Awards: Couture award, London, 1964. Address: 40 rue François Premier, 75008 Paris, France. La robe: essai psychanalytique sur le vêtement, with Eugénie Lemoine-Luccioni, Paris, 1983. Halliday, Leonard, The Fashion Makers, London, 1966. Lynam, Ruth, Couture: An Illustrated History of the Great Paris Designers and Their Creations, Garden City, New York, 1972. Guillaume, Valérie, Courréges, Paris & London, 1998. Wolfe, David, "Courréges," in International Textiles (London), April 1990. Schneider, Karen, "Up, Up and Hooray! Designer André Courréges Celebrates 25 Years of Miniskirt Fame," in People, 9 July 1990. Betts, Katherine, "Courréges: Back to the Future," in Women's Wear Daily, 22 January 1991. Schiro, Anne-Marie, "Sixties Revival is Official: Courréges is Back," in the New York Times, 19 February 1991. Drake, Laurie, "Courréges and Balenciaga: Some of the Best Spring Fashion Bears the Signature—or the Spirit—of Two Great Designers," in Vogue, March 1991. "Back on the Block: With 1960s Fashions Back in Vogue, André Courréges is Decades Ahead of the Trend," in Chicago Tribune, 6 March 1991. Horyn, Cathy, "Men of Metal and Mod," in the Washington Post, 14March 1991. "Courréges," special supplement of L'Officiel (Paris), 1994. André Courréges, designed for Samuel Robert's 1964 collection: goatskin walking suit. André Courréges, fall 1968 collection: wool coat with leather inset band. White, Constance R., "Courréges Encore," in the New York Times, 20March 1995. "Courréges Buys Back Perfume," in the Wall Street Journal, 6September 1996. 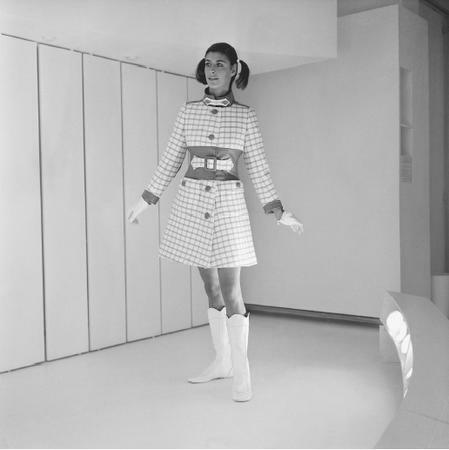 One of a generation of strikingly innovative designers working in Paris in the 1960s, André Courréges was one of the first since Chanel to understand the potential in womenswear of using items from the male wardrobe. His goal became to provide the same simple range of garments for women, not by mere appropriation of male adornment, but inventing a totally new modernistic aesthetic. Courréges regarded the 1950s silhouette of a tightly boned and wasp-waisted mannequin, teetering on impossibly high stiletto heels, as completely alien to the needs of the modern woman of the 1960s, even though he had worked for Balenciaga for 11 years, from 1950 to 1961, as chief cutter. Courréges subsequently left to set up his own business with his wife Coqueline. Their first collection, using tweeds and soft wools, had yet to shake off Balenciaga's influence. Ultimately Courréges saw the male wardrobe as more logical and practical than a woman's because of its unadorned and reductionist nature, resulting from its being pared down to the barest essentials over the passage of time. Yet he responded to the challenge as an engineer—one well-versed in functionalism and utilizing the skills he had learned and finely honed at Balenciaga—and with his own modernist tendencies conceived a new look of femininity entirely different from that of Balenciaga. Cutting skills were used to free rather than contain the body, emphasized by short trapeze skirts for extra movement. By 1964 Courréges was producing spare but not spirited ranges of clothing, such as his monochromatic pinafore dresses and suits with hemlines well above the knee, all in crisply tailored, squared-off shapes. Renouncing the stiletto as an item of clothing symbolizing women's subordination, Courréges provided his models with flat-heeled white glacé boots and accessorized his honed-down clothes with extraordinary headgear such as futuristic helmets and strange baby bonnets. Courréges believed the foundation of successful design was in understanding function; correct form would automatically follow. Aesthetics was only the wrapping. The only decoration to be found on Courréges clothes was either directly allied to its construction, as in the use of welt seaming, or was minor such as the small half belt on the back of his coats. One decorative device he reveled in and which was copied extensively within mass market fashion was his use of white daisies made out of every conceivable material such as sequins, lace, or used as patches. 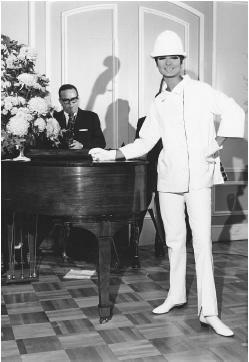 It is still debated whether or not Courréges invented the mini skirt, but he was indisputably responsible for making trousers and matching tunic tops de rigueur for every occasion, overturning the taboo of trouser wearing by women, creating versions slit at the seam to give an exaggerated elongation to the female body and emphasizing this clean streamlined look by using lean, well-muscled female models. Courréges displayed his love of construction in his use of chevron stitching, such as that used in 1965 at the hips of dresses and trousers, and his use of devices such as the bib yoke, keyhole neckline, and patch pocket. Hip yokes and welted seams with top stitching emphasized the lines of the garment, the stitching occasionally deployed in contrasting colors, such as orange on white, to exaggerate the details of assembly. Courréges collections were copied and disseminated worldwide, although the taut outline of the originals was lost when cheaper materials were used. Consequently he refused to stage shows for the press or retail buyers and would only sell to private clients, biding his time until he was ready to produce his own ready-to-wear collection, entitled Couture Future, in 1969. By this time, however, his hard-edged style had become dated in comparison with the hippie, ethnic style of the 1970s and his seminal structured A-line dresses with welt seams and square-cut coats on top seemed out of step with contemporary fashion. By the early 1990s Courréges was again designing successfully, spurred by a 1960s revival where his short trapeze dresses and metallic clothing were rediscovered by a new generation. He had his own boutique in Bloomingdale's New York flagship store, as well as in Bloomingdale's stores around the country. The Courréges name was on everything from his well-known bodysuits and skirts to scooters, gourmet food, and home furnishings. Like fellow futuristic designer Paco Rabanne, Courréges enjoyed this fashionable rebirth for several years, reveling in the limelight and a slew of new, younger clients. In 1992 Courréges sold his fragrance division to the Swiss Burrus Group; five years later, still riding high and one of the few remaining independent designers in a time of mass consolidation (think LVMH), Courréges was able to buy back his perfume business from Burrus for $7.5 million. In the 21st century, the Courréges name still carried clout—in and around in Paris and in New York. Dozens of shops ringed the globe, especially in Japan, where the Courréges label was a favorite in department stores. Will the future be a bright and wonderful place for Courréges fashion? As he explained to the Chicago Tribune in 1991, "It wasn't me who was ahead of my time, it was my time that was behind me." Has time caught up with André Courréges? Only he knows for sure.